Canyon ratings are a simple, concise method of giving the adventurer an idea of what they are getting in for. Given the often-changing nature of canyons, they are by necessity rather a blunt instrument. With more or less water, a few logs shifted here or there, a good day vs. a bad day, the experience of being in a particular canyon can be quite different—but we TRY. Ratings are estimates for fit adults in small groups, with proper gear, and in normal conditions. But, I digress. We have ratings so you, dear reader, may find ventures appropriate for your abilities and proclivities. Canyoneering ratings also indicate a canyon's "seriousness" and provide guidance on what gear to bring. The wise adventurer chooses companions for which the canyon is also appropriate, thus extending, rather than shortening, friendships. I also provide a Quality Rating in the form of zero to three stars. Other information providers might work on a different scale of five stars, or even ten stars. There is no standard system. When adventures involve up-climbing similar to actual rock climbing, I use the Yosemite Decimal System (YDS), the North American standard for rating rock climbing routes. More recently, we have been working on a more-or-less uniform scale of SLOT ratings describing the difficulty and seriousness of the narrow-slot-canyon climbing found in North Wash, near Lake Powell and in similar terrain. This is a work in progress. Canyoneering ratings begin with a number, 1 through 4, broadly describing the technical nature of the canyon. This rating immediately provides a sense of skill appropriateness and necessary gear for the descent. For example, canyon ratings beginning with a "1" will be good candidates for my 6-year-old niece to join me on, as "1" indicates a fairly casual hike/walk. Anything rated with a "3" or "4," however, will certainly require rappelling; since my niece doesn't know how to rappel and I don't have a children's harness, I know this particular canyon is out of the question. CLASS 4 - Advanced Canyoneering Aid climbing, multi-pitch rappels and/or complex rope work (such as re-belays, tyrollean traverse, or guided rappels) may be required. Might also require difficult pothole escapes, serious squeezing, extensive high-risk downclimbing, or have difficult-to-establish natural anchors. Rappels longer than 200 feet will usually earn a canyon a Class 4 rating. A: Normally dry or with very little water. Wading to waist deep at most. B: Water with no current or light current. Still pools. Falls are normally dry or running at a trickle. Swimming expected. C: Water with strong current. Waterfalls. Wet canyon rope techniques required. Flowing water introduces further complications into canyon scenarios, as it can drown out human voices, limit visibility, and push canyoneers and gear around. High water flow can create very dangerous immobilizing/drowning scenarios. Canyons have a Water Class rating for the above reasons, but please understand the Water Rating is interlinked with the technical rating. Water and flow in non-technical portions of the canyon do not count! The only water that counts is that which complicates the technical descent of the canyon, either due to ropework or to downclimbing. Small amounts of flow generally make the canyon more fun, without actually increasing the technical difficulty, and should not automatically create a Class C rating. However, even a small flow can complicate things like communication and rope-pulls. The Water rating is for the canyon in normal conditions. ANY canyon, in flood, will require extraordinary skills - but this does not make the CANYON a Class C canyon. Many canyons are likely to have standing pools after a rainstorm—this does not make them Class B canyons. Grade ratings estimate the time commitment the canyon involves for a small (4-6 people) descent team of experienced, fit adults moving at a good pace... but it includes the usual poking around and picture-taking. Parties with team members not yet proficient with technical aspects of canyoneering should allow 50% to 100% more time than indicated. Conversely, one can judge how one is doing on the canyoneer-proficiency scale by how one's party does against the "book" times. (No Rating) - Normal risk factors are present on this adventure. R-Risky - One or more extraordinary risk factors exist that complicate the descent. Solid technical skills and sound judgment required. Not appropriate for beginners, even with competent leadership. X-Extreme - Multiple risk factors exist that will complicate the descent. Errors in technique or judgment will likely result in serious injury or death. Descent should be attempted by expert canyoneers only. This is the least-well-established part of the rating system, and the most subjective. 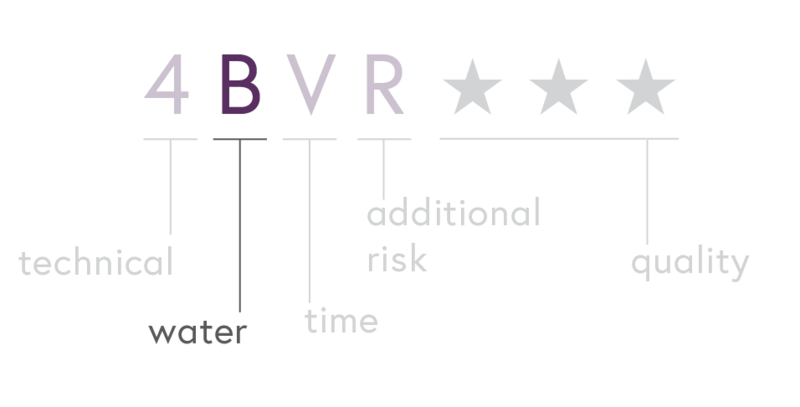 Use by beta-providers varies widely, to the point that this part of the rating means very little. In this case, the canyon has both a difficult upclimb, usually done by pulling on gear (5.10 C2), and some difficult and dangerous canyon-climbing type stuff, which is not too bad (X-minus). ★★★ - A Classic. Really good. ★★ - Pretty Good, well worth doing. ★ - Has redeeming qualities. (0 stars) Probably not worth the bother. Since Tom's Utah Canyoneering Guide focuses on canyons that are good, there are very few canyons in here that do not get a 2-star or 3-star rating. Any rating assigned is, of course, only my considered evaluation based on one or several or quite a few trips through the canyon, plus discussion with other canyoneers. Please be ready for the canyon to be considerably harder than stated because, well, it might be. Picking a canyon that's appropriately matched with skill level and personal preference play a large role in the happiness of your crew. All adventures require map-reading skills and a map. Careful analysis of the route description should indicate the difficulty of getting there and back, but the route descriptions do not replace carrying and using a good map. Hikers of Reasonable Fitness and Skills will like 1A, 1B, 2A and 2B adventures. They may like the easier 3A and 3B routes, if they have a little climbing experience or an experienced companion. Carefully read the 3A and 3B route descriptions to make sure you are up to the technical obstacles involved. Climbers will generally enjoy 3A and 3B routes. The set of skills required for technical routes has little to do with yanking your way up the local clip-up, and everything to do with good ropework, judgement and experience. It is essential to have the right gear and know how to use it - like lots of slings, static ropes and wet suits. 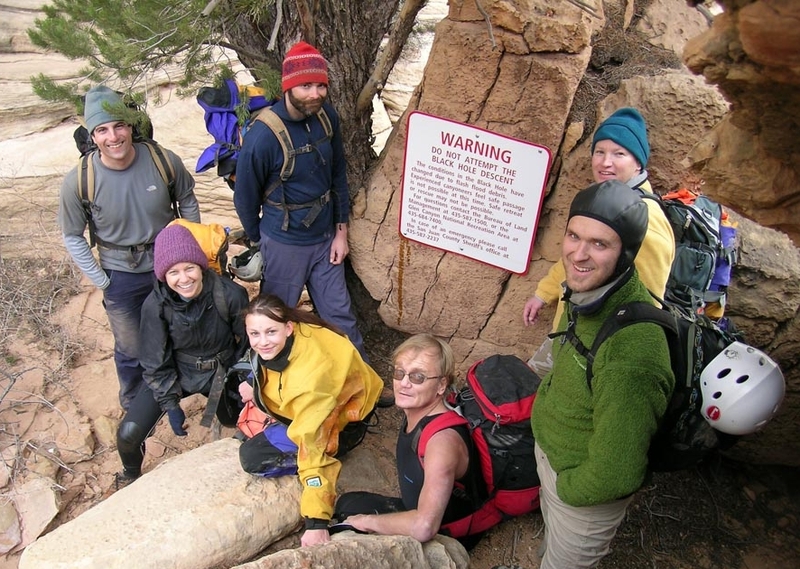 Develop creative natural anchor skills by getting out with experienced canyoneers. Climbers will want to have at least ten or fifteen 3A and 3B routes under their belts before taking on 4A and 4B canyons, or any canyon with an R or X rating. These canyons require skills not part of the normal climber's repertoire, and may need to be researched ahead of time. Mentoring with canyoneers would probably be a good idea. Experienced Canyoneers understand flowing water has its own risks and techniques that require special training. Class 3C and 4C canyons should only be attempted by trained, well-equipped canyoneers. Leading large groups of non-canyoneers into canyons is not usually a good idea. Especially in wet canyons, things can get out of control very quickly. It is not uncommon to see a large group of non-climbers being led by one novice climber in a technical canyon, like Zion's Pine Creek, making poor decisions and putting innocent people at risk. Don't do this. Practice rappelling in a safe and comforting environment, outside the confines of a canyon, and prepare by starting your group with short, simple canyons. Large groups are as slow as their slowest member, and then slower. Youth groups get in trouble all the time in Utah, often resulting in rescues and occasionally in deaths. Technical canyons are not good places for inexperienced youth groups. Find some other form of adventure. If your group is larger than six people, break into two groups to make the going faster and decrease your environmental impact. Everyone in your group needs the right gear. Looking for something specific? Check out the CUSA store. Always: A drybag, quick-dry clothing, and a sweater to warm up after the surprise swim. 1A and 1B: A map. 2A and 2B: Map and compass or GPS. A short rope for lowering/raising packs may be helpful. 3A and 3B: Ropes and technical gear. Helmet, harness, sticky shoes, rappel device, locking carabiner, safety tether and rappeling gloves for each and every person. Some webbing, 4-5 over-the-shoulder slings, and rapid links in case anchors need to be re-rigged. It is helpful to have tiblocs or prusiks and enough slings to use them. As always, a map may be required. A leader who knows what they are doing. 4A and 4B: These canyons require more gear, self-reliance and skills, matched to the difficulties found in the canyon. Bring all the above gear for a 3B canyon, but be more conservative and thorough. An extra rope or pull cord may be a good idea. 4A and 4B canyons may have old or unsafe bolts that are unreliable; good natural anchor skills will allow you to bypass suspect hardware. An R or X indicates greater seriousness, and suggests needing more skills or bringing more stuff (long slings, hook kit, etc.) for improvising anchors and pushing through technical obstacles. A bolt kit is rarely useful in canyoneering, especially when the obstacles are of the SLOT variety. What carries the day is canyoneering experience; skills learned by doing difficult canyons.